Jamie Ivey continues his adventures in Provence wine, with a visit to Laurent Tardeieu a ‘devil’ negociant. My adventure in wine started 8 years ago now in a Parisian restaurant called Juveniles. A friend of a friend knew the owner Tim Johnston. I was researching a book called Extremely Pale Rose (accent omitted) about the hunt for the palest pink wine in France. The only problem was I knew next to nothing about wine. Tim was the man, who over several bottles of red, charted my path across France, detailing wine producer after wine producer who I had to go and see. To a vineyard these men and women were all independent producers. They made and bottled their own wine on the premises and were fiercely proud of the fact. During the course of a long summer, I learnt that the French concept of terroir, extended further than just the soil and climate, to the hands and heart of the vigneron who owned the land. Expressions such as the ‘wine speaks of the people’ started to make sense. Ever since when I have tasted a wine, I think of the vigneron in the fields, bent back, pruning the dead growth in the depths of winter with each individual vine almost a personal friend. These independent vignerons also taught me about the supposed ‘devils’ of the wine business – the negociants. I was told that typically negociants were big businesses that bought grapes and or wine from across France and shipped the product to soulless factories where they employed an army of chemists to churn out a standardised product. Not only did negociants commit the crime of homogenising wine to accord to the supposed tastes of the consumer, they were also, according to my vigneron independant chums, all too liberal with the sulphur. This helped the wine on its long journeys to and from the factories. In wine shops ever since I have eschewed anything made by a negociant. Until that is curiosity overcame me. No more than 1km from where we live there is a small negociant called Laurent Tardieu. I’ve always known the bureau and wine making facility were there, but never taken the trouble to visit. Last week I put my prejudices to the test with Bastien Tardieu. We stood together in the basement where over 400 barrels of wine were slowly ageing, each labelled with the region of origin and the name of the producer. 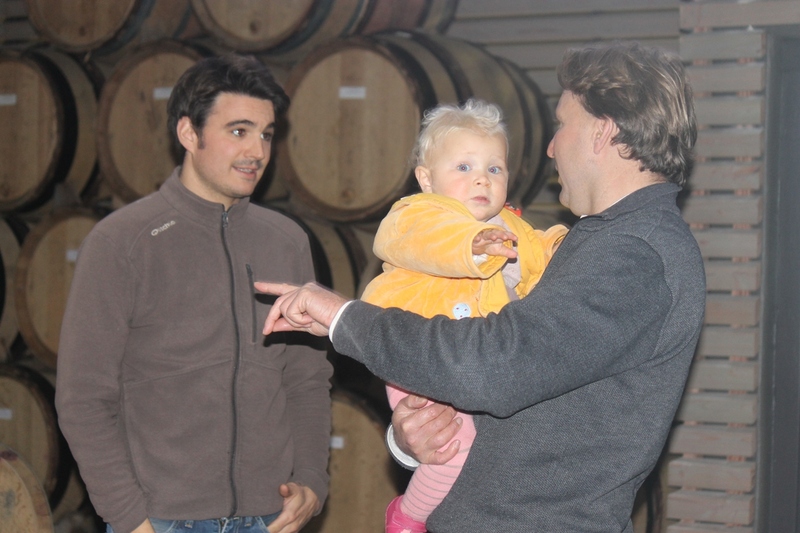 Bastien explained that in each of the appellations that the Tardieus operate, their aim was to showcase the very best attributes of the region. The Tardieus work with numerous small producers, purchasing a small percentage of the harvest once the grapes have been pressed and fermented. 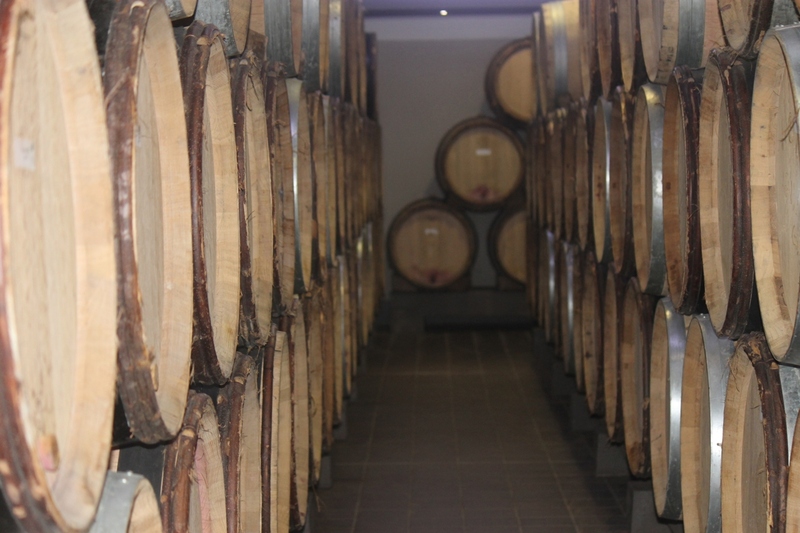 The purchased wine is put into the Tardieus oak barrels on site and then transported to their ageing facilities in Lourmarin. The Tardieus range of wines covers nearly all of the major names of the Rhone valley, from entry level Cote du Rhone at 15 euros a bottle to Chateauneuf at around 40 euros. Annual sales amount to 100,000 bottles a year, many of them through the UK fine wine importer Corney and Barrow. I purchased 12 bottles from a selection of different appellations including Cote du Rhone, Vacqueyras, Bandol and Rasteau. The wines I have tasted so far have been almost unbelievable good, finely balanced, with depth and length of finish. There has been no hint of the chemicals my dear friends the vignerons independants promised me I would taste on every sip of a negociant wine. There’s no doubt that from now I will become a regular at the doors of the Tardieus office. Great wine on your doorstep, who could ask for more? And yet my cave will remain largely stocked with vigneron independant wine. Unblemished perfection such as the Tardieus deliver is wonderful once in a while, but for the most part I want to drink wine that speaks of the raw heartbeat of France, the man in the fields hammering out a living, so what if some years the wine is so bold that it smacks you in both jaws, it’s the mistakes and annual differences which make wine so interesting. Popular in Provence wine: Chasing the Dream – Will William Chase of Tyrrell’s crisps fame succeed where other wealthy would-be vigneron’s have failed and make money out of a Procencal vineyard? and Wine – Greats of Provence – Chateau Simone and the story of how a vineyard’s wine can become just too popular. Planning a holiday in Provence then check out the great Guru Provence villa rental pages. We’ve got great Provence villa rentals stretching from Saint Remy in Les Alpilles to Gordes in the Luberon. For reliable, luxury Provence vacation rentals from the Guru, click here. We’ve also got a great selection of Provence boutique hotels for that special holiday. And to get you in the mood for the South of France, why not try our recipes on the Provence Food pages.